As you know, on Thursday we celebrate Thanksgiving Day. Yet for many of us, that day is so full of activity that we actually have little time for intentional, extended giving thanks to God. So, as has been my tradition for many years, I will put up several posts in anticipation of Thanksgiving Day in order to encourage my readers to let this whole week by devoted to genuine gratitude. 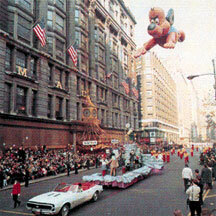 I grew up watching this parade on television, marveling at the giant helium balloon representations of Underdog and Bullwinkle, and waiting for Santa to appear to kick off the Christmas shopping season. In 1982 I had the privilege of spending Thanksgiving Day in New York City. Of course I had to see the Macy’s Parade in person. There, standing alongside Central Park, I watched the bands and giant balloons from only a few feet away. I discovered that it was a lot colder watching the parade in person than from the comfortable vantage point of my living room. But plenty of hot coffee kept me going through the whole spectacle. That evening some friends and I had Thanksgiving dinner at the Helmsley Palace Hotel. (Yes, the one once owned and managed by the infamous Leona Helmsley and her husband.) We arrived an hour before our prearranged sitting and enjoyed appetizers in the hotel bar. 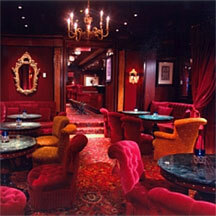 It was the most elegant place I had ever enjoyed a drink and some peanuts. And, believe me, I paid for every inch of elegance. Thanksgiving dinner was served in the fabulously ritzy dining room. It was one of the most over-the-top meals of my life. But it still wasn’t quite right. After all, the heart of the Thanksgiving holiday isn’t going to parades or eating fancy meals. It’s about sharing a day with family, and mine was 3,000 miles away. The best tasting turkey in the most opulent dining room didn’t satisfy the real longing of my heart – to be home. If you think about it, however, the actual events of Thanksgiving Day can be rather underwhelming. In addition to watching the Macy’s Parade, tens of millions of people (mostly men) watch football, while tens of millions of people (mostly women) cook mass quantities of traditional food. Then they all get together to eat more than they should, only to top off their gluttony with pumpkin or mince pie. 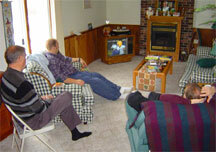 Then there’s clean up, a bit more TV, and that just about sums up the day for many of us. It’s more about our stomachs than our hearts. A college friend of mine named Jeff decided one year that his family’s Thanksgiving was far too secular. So Jeff, as a new Christian, volunteered to say the blessing before the meal. It was usually done perfunctorily by the most religious of the uncles, which wasn’t saying much in Jeff’s family. But Jeff was going to redeem Thanksgiving once and for all. So when it came time to pray, he started in thanking the Lord for the family’s many blessings. Then he turned to larger issues, expressing gratitude for freedom, for our country, and so on. Finally Jeff got explicitly religious, using his prayer as an opportunity to evangelize his godless relatives. After about five or six minutes, these godless relatives were about ready tar and feather Jeff. Finally his mother tapped his arm and said softly, “Honey, don’t you think it’s time to eat now?” In response to which the slightly religious uncle yelled, “Amen!” Jeff’s family immediately dug into the turkey, leaving Jeff somewhere mid-sentence. Now I do not recommend Jeff’s evangelistic strategy. But I do appreciate his heart. Thanksgiving should be about more than a parade and pumpkin pie. In spite of the modern penchant for referring to the day as “Turkey Day,” it’s still meant to be a time for intentional gratitude. This was, as we’ll see in a later post, at the heart of Lincoln’s establishment of Thanksgiving Day as a national holiday in 1863. But I am going to ask you not to forget the heart of Thanksgiving. In fact, I’m going to encourage you to let Thanksgiving be more than just a day. Why not take time this whole week to remember God’s blessings? If your Thanksgiving Day is already full with family folderol, then set aside some time on the day before or the day after to remember all that God has given, and to say “Thank you.” Better yet, do this for several minutes each day this week. If you do, not only will you be doing the right thing, since God deserves thanks for all he has done for you, but also you will find that your celebration of Thanksgiving is richer and fuller than you have imagined it could be. Expressing heartfelt gratitude to God is one of life’s greatest joys. It’s a joy that many of us rarely experience. And it is the true heart of Thanksgiving. So let me invite you – yes, urge you – to take time this week for real expression of gratitude to God. You’ll be glad you did. Note, if you’re having a sense of déjà vu as you read this post, you’re not crazy. This is a revised version of a post I put up a few years ago. The below is not necessarily true. I might be crazy, regardless of deja vu experiences. >>Note, if you’re having a sense of déjà vu as you read this post, you’re not crazy. This is a revised version of a post I put up a few years ago. Gary. Good point. Good point. Sorry for the double post, which was unintended. Of course, let’s keep it in perspective: Thanksgiving is not a Christian holiday. It may have had Christian motives behind it, and now (though not in my faraway youth) there are even church services on the eve or day, but it isn’t up there with Christmas and Easter, or even Pentecost. Kozak: You’re right, to be sure. But setting aside time in one’s life for gratitude is surely a good and even Christian thing, yes? It’s rather like using Mother’s Day as an occasion to remember our mothers in our prayers, I think. Actually, I thought the double-post by Gary and the “Good point. Good point.” in response were part of a finely-honed “Who’s on First?” style repartee. Unintended humor is still, well… humorous.